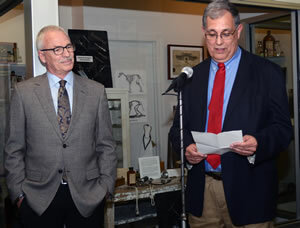 Ronald Cott, DVM (left), listens as William J. Shore, DVM, chair of the Missouri Veterinary Medical Foundation Board, reads comments submitted by Lauren Smith, DVM, who nominated Cott for the Missouri Veterinary Medical Foundation Veterinary Honor Roll during an induction ceremony held April 30. Ronald Cott, DVM, who retired last year from his position as MU College of Veterinary Medicine associate dean for Student and Alumni Affairs and executive director of Advancement, was inducted into the Missouri Veterinary Medical Foundation (MVMF) Veterinary Honor Roll on April 30. The Veterinary Honor Roll recognizes veterinarians who have been nominated for inclusion by those whose lives they have touched. Their names and photographs are presented in a display within the foundation’s museum at the Missouri Veterinary Medical Association offices in Jefferson City. 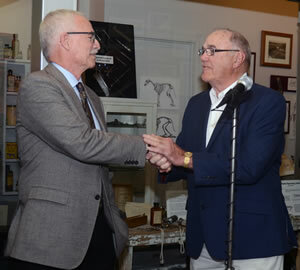 Robert “Bud” Hertzog, DVM, congratulates Ron Cott on his induction into the Missouri Veterinary Medical Foundation Honor Roll. Cott, who graduated the CVM in 1973, served in the U.S. Army before entering private companion animal practice in the Kansas City area. He joined the CVM in 2001 as associate dean. Since retiring, he has served as adjunct clinical assistant professor and an Advancement consultant for the college. 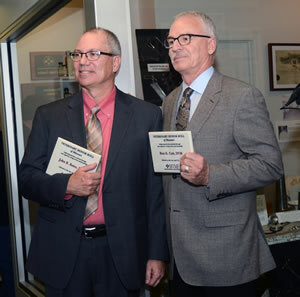 John R. Bates, DVM, and Ron Cott display their Veterinary Honor Roll plaques. A former student, Lauren Smith, DVM, a member of the CVM Class of 2012, nominated Cott for the honor. He was one of two people inducted into the honor roll during the ceremony. John R. Bates, DVM, was also added to the honor roll. 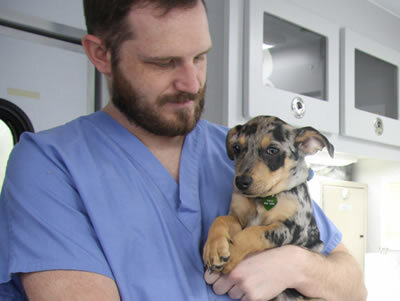 Bates is the owner of Imperial Animal Hospital in Imperial, Missouri. He is a 1983 graduate of the CVM. The MVMF Veterinary Honor Roll has 62 members.